This patient came in the other day needing some minor work. The bulb was flickering and when it was being removed the bulb base came off and was left in the lamp. This lamp doesn't need any lamp parts, but we use a specialty lamp tool to remove this bulb base: chain pliers. 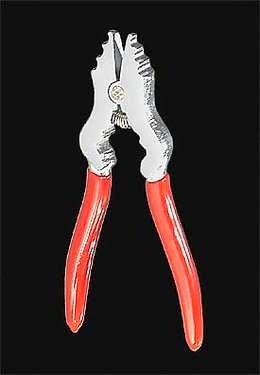 You could also use needle nose pliers or wire pliers. Two important things to remember: one, unplug the lamp; two, do not damage the socket interior. Since this lamp was already in the shop we took a moment to tighten it with a pare of pliers. The bottom nut is tightened and the neck below the socket gallery is tightened. This lamp is perfect again.